If I were to ask any student what the purpose of an internship or fellowship was they would likely give me answer that’s an iteration on the themes of career development, real world experience, or to build professional skills. When I ask an intern or fellow in the Office of Academic Innovation that same question and why they chose this learning experience with us, there are similarities, but the difference is our approach to creating an environment based in experiential learning that fosters a sense of community, in addition to doing real work in preparation for meaningful opportunities after graduation. Within the Office of Academic Innovation, we are unique in the type of student experiences we offer due largely because we offer internships and fellowships for undergraduate, graduate, and Ph.D. students. The type of experiences we offer include, but are not limited to, Software Design, Graphic Design, User Experience Design, Data Science, and Innovation Advocacy. Students are able to get real-world experience and work directly alongside full-time staff and myself for additional opportunities to network, and for professional growth. I recently joined the team as the Student Program Coordinator and one facet of my role is to help foster a sense of community and collaboration while providing a solid foundational structure for our intern and fellowship program. Most recently, our interns engaged in our first, half-day team building retreat, which focused on creating a cohesive bond of students as one collaborative unit. This was achieved by choosing strategic team building activities to target communication, cooperation, and trust and impact growth by getting them out of their comfort zones. Throughout the day, we reflected on commonalities and connections of what we were actively engaged in and why it was important. 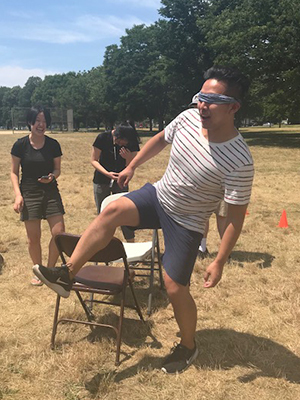 The biggest lesson came from our blindfolded obstacle course because it demonstrated to the interns that, although they may be walking through the course alone, it took their teammates’ guidance, and a proper communication strategy, to get through it. They needed to learn how to trust their teammates in order to make it through the obstacle course. 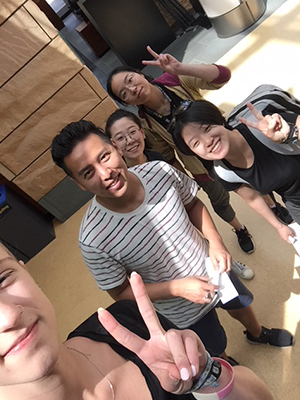 It was important to give students the opportunity to learn how to work as a team with their peers as well as develop communication strategies, because these are transferable skills they will take with them to another collaborative work environment. The event was not based solely on team building activities. I wanted to make sure the interns had time to get to know one another, have fun, and enjoy the outdoors, so I mixed in activities like kickball, water balloon toss, and a giant jenga competition. I also made sure there was time for conversation with one activity called “Turn it Around.” Through this activity, the interns learned how to reframe negative situations into learning experiences and find the positive in everyday situations. 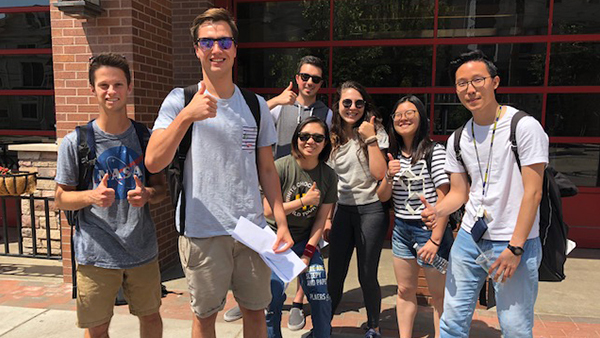 Through the right balance of teamwork and play, this event allowed our interns to bond as a cohort, grow as professionals, and open up as themselves. After reflecting on the day’s success and the positive impact it had on everyone who participated, I look forward to offering more opportunities like this in the future to continue supporting our students’ learning and success.